The Project Haystack Organization, a collaborative community addressing the challenge of utilizing semantic modeling and tagging to streamline the interchange of data among different systems, devices, equipment and software applications, today announced the publication of their fifth issue of Haystack Connections Magazine with 62 pages of interviews, articles and tools, from companies around the world including Bedrock Detroit, Nube iO, BTIB, Lynxspring, BuildingFit and Tridium, to name a few. RICHMOND, VA. (PRWEB) JANUARY 15, 2019: The Project Haystack Organization (https://www.project-haystack.org), a collaborative community addressing the challenge of utilizing semantic modeling and tagging to streamline the interchange of data among different systems, devices, equipment and software applications, today announced the publication of their fifth issue of Haystack Connections Magazine. 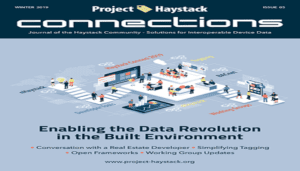 The Connections Magazine Winter 2019 issue reports on the latest news from the Project Haystack community from around the world and documents how rapidly the data revolution is overtaking the built environment. Both IT and OT contingents are recognizing that sematic data modeling and metadata tagging is key to clearing the hurdles related to ease-of-use, unified data flow, edge-to-cloud, and data security. Not to be missed is the fact that the storytellers in this issue include the end users of the data generated by equipment systems including commissioning experts, smart building consultants, large-portfolio property managers and developers – all of whom are demanding smarter, interoperable solutions, and companies that are responding by providing Haystack-compatible products and solutions. Director of Building Systems at Bedrock in Detroit, Michigan, a featured profile of the newest member of Project Haystack, BuildingFit, and community-contributed articles by BASSG, BuildingFit, Intellimation, J2 Innovations, Lynxspring, and Nube iO. Featured are some of the latest tools and services that support Haystack from BTIB, J2 Innovations, Lynxspring, OnBoard Data and Tridium. This issue also includes updates on technical resources, Project Haystack Working Groups, as well as the Project Haystack Organization roster of members. While building systems have been the place where Project Haystack gained traction and adoption, the Haystack methodology is not just about HVAC, temperature sensors, fans, meters, and building systems. The IoT, BIoT and the IIoT are bringing diverse smart devices into homes, high-rise commercial buildings, industrial facilities, factories and agriculture. As smart devices proliferate into solutions no one could have ever imagined even a few years ago, coming from different suppliers around the world, the opportunity for implementing a data management strategy that includes tagging has become even more critical. The Project Haystack Connections Magazine Winter 2019 Issue is available for download at https://project-haystack.org/file/32/Haystack-Connections-Magazine-Winter-2019-Issue-5.pdf. The Project Haystack Organization consists of Founding Member and Board Member companies Conserve It, Intel®, J2 Innovations, Legrand, Lynxspring, Siemens and SkyFoundry, and Associate Member companies Accu-Temp Systems, Altura Associates, BASSG, Bueno Systems, BuildingFit, CABA, Energy Management Association, Intellastar, Intelligent Buildings, IoT Warez, KMC Controls, KNX Association, Kodaro, sensorFact, Tridium, VRT Systems and Yorkland Controls, as well as numerous Haystack supporters involved in Working Groups. More information about the Haystack methodology, the Project Haystack Organization and membership is available at: https://www.project-haystack.org. The Discussion Forums can be found at: https://www.project-haystack.org/forum/topic. Information about Haystack Connect 2019 sponsorships, speaking opportunities and registration to attend is available at https://www.haystackconnect.org. About Project Haystack: Since its formation in March of 2011, the Project Haystack Organization (a 501(c) non-profit trade association) has been providing the industry with an open-source, collaborative environment to address the challenge of making data self-describing using semantic modeling, also known as data tagging. The work developed by the Project Haystack member companies and community streamlines the process of managing, presenting and analyzing the vast amount of data produced by smart devices and equipment systems. The Haystack methodology can be used with virtually any type of system and device data and is not tied to any vendor or communication protocol. More information about Project Haystack is available at: https://www.project-haystack.org.